Sunday’s New York Times Magazine had an article about chickens. Evidently serving your family free-range, organic eggs is not enough… one must now hand-raise the chickens personally. I skimmed the article quickly, my imagination struck by the concept of four separate women, none of whom know each other, all working diligently in midtown Manhattan to raise chickens. That’s how strong the New York Times-New York city pairing is in my brain. But alas, author Peggy Orenstein lives in Berkeley, California. Ahh. This makes much more sense. 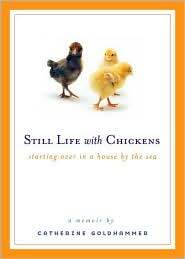 Still, it reminded me of a lovely memoir of a tough time: Still Life With Chickens, Starting Over in a Life by the Sea. Subscribing to my husband’s point of view (do judge a book by its cover), I took the slim volume out from the library, charmed by the chickens. Catherine Goldhammer’s work is a lyrical, funny, heart-touching story of an upscale mom who suddenly found her life in upheaval. Divorcing, poorer, emotionally a wreck, this newly single mom moves herself and her daughter from their affluent New England suburb to a small town by the sea. Their new home requires an ungodly amount of work, so of course, she impulsively purchases several tiny chicks. She and her daughter raise them, first in their bathtub (the only bathtub in the house), then in a chicken coop. I genuinely feared for the chickens when cold weather set in… the tension was nail-biting. Renovating her ramshackle home. Nurturing the chickens. It’s all a part of self-discovery, recovering, and growth for Goldhammer. If life is a journey, Still Life with Chickens reminds us that having a focus other than our own plodding footsteps eases the burden and opens our eyes to the world around us. This entry was posted in Commentary, Review and tagged Catherine Goldhammer, chicken coops, fiction, memoir, New York Times, raising chickens, Still Life with Chickens. Bookmark the permalink. You know, I’ve thought about raising chickens for fresh eggs! But then, my neighborhood doesn’t even allow clotheslines so I don’t suppose I could get away with it. But I will pick up this book – thanks for telling us about it.